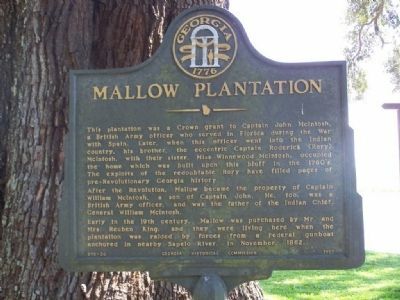 This plantation was a Crown grant to Captain John McIntosh, a British Army officer who served in Florida during the War with Spain. Later, when this officer went into the Indian country, his brother, the eccentric Captain Roderick (Rory) McIntosh, with their sister, Miss Winnewood McIntosh, occupied the home which was built upon this bluff in the 1760`s. The exploits of the redoubtable Rory have filled pages of pre-Revolutionary Georgia history. After the Revolution, Mallow became the property of Captain William McIntosh, a son of Captain John. He, too, was a British Army officer, and was the father of the Indian Chief, General William McIntosh. 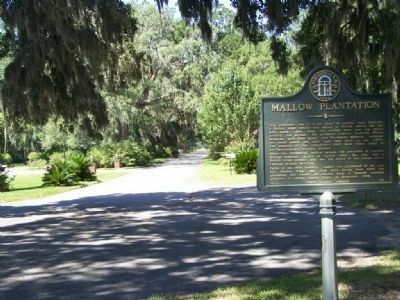 Early in the 19th century, Mallow was purchased by Mr. and Mrs. Reuben King, and they were living here when the plantation was raided by forces from a Federal gunboat anchored in nearby Sapelo River, in November, 1862. 31° 32.825′ N, 81° 22.457′ W. Marker is in Pine Harbor, Georgia, in McIntosh County. Marker is on Pine Harbor Road. Touch for map. 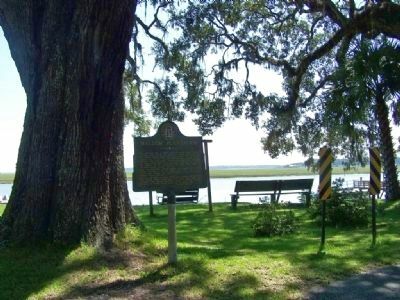 Marker is on the Sapelo River at the end of Pine Harbor Road. Marker is in this post office area: Crescent GA 31304, United States of America. Touch for directions. Other nearby markers. At least 8 other markers are within 4 miles of this marker, measured as the crow flies. Colonel John McIntosh (about 700 feet away, measured in a direct line); Captain William McIntosh (about 700 feet away); Old Belleville or Troup Cemetery (approx. 1.1 miles away); Baisden's Bluff Academy (approx. 2.6 miles away); John Houstoun McIntosh (approx. 2.8 miles away); Rice Hope (approx. 2.9 miles away); Old Court House at Sapelo Bridge (approx. 3.1 miles away); Sutherland's Bluff (approx. 3.1 miles away). Touch for a list and map of all markers in Pine Harbor. 3. Mallow Plantation Marker, looking back, westward on Pine Harbor Rd. More. Search the internet for Mallow Plantation. Credits. This page was last revised on June 16, 2016. This page originally submitted on September 14, 2008, by Mike Stroud of Bluffton, South Carolina. This page has been viewed 1,657 times since then and 14 times this year. Photos: 1, 2, 3. submitted on September 14, 2008, by Mike Stroud of Bluffton, South Carolina. • Bill Pfingsten was the editor who published this page.